This painting by Emanuel Leutze, done in 1851, is an example of a history painting. 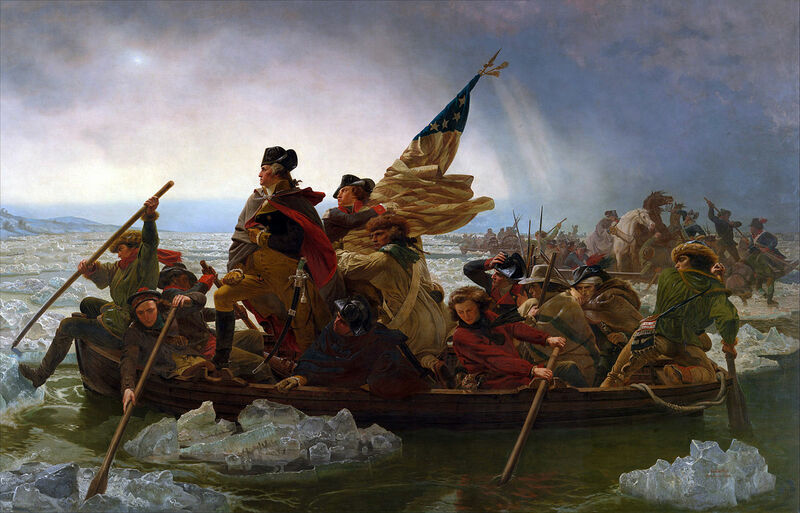 George Washington is depicted as the hero of this turning point in the American Revolutionary War, but Leutze takes liberty with the details: the stars and stripes flag was not used until 1777. "Ever since I started doing those appropriations, there's been criticism. . . . I started doing that in '75 when I painted George Washington Carver Crossing the Delaware—which is a much more complicated painting than a lot of people think. . . . It's a lot more than a one-liner . . . it's about white perceptions of Black people. It's the satire that kills the serpent." The heroic figures of Emanuel Leutze’s painting are replaced by racist Black stereotypes to confront history, the role of the artist, and the role of the viewer. Colescott calls out the selective representations of Black people as told by a white establishment. Some historians understand the figures in this painting as white individuals in Blackface. As early as the Second Enforcement Act of 1871, antidiscrimination legislation made racist imagery a punishable offense; however, Blackface was still seen as humorous by white audiences. 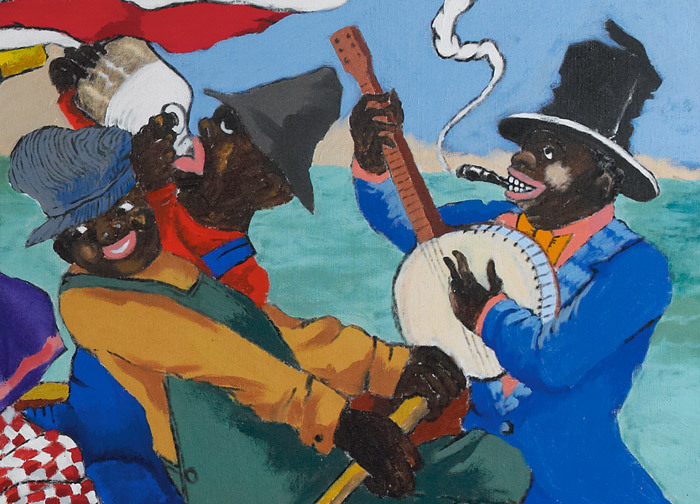 Colescott's sensational painting makes clear that the creation of racist stereotypes, such as the ones we see here, was a tool of the white majority to oppress people of color. George Washington Carver (1860s–1943) was born into slavery and became an innovative agricultural scientist. His work solved the problem of overproduction of Southern fields to help struggling sharecroppers in the South, many of them former slaves. 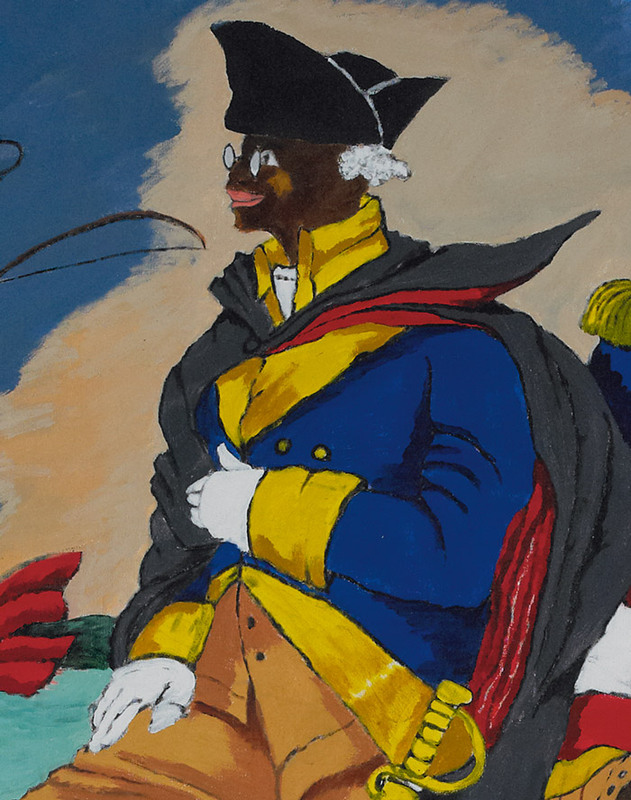 Colescott re-creates Emanuel Leutze's painting with an all-Black cast to tell a story of Black American achievements that are often left out of history. 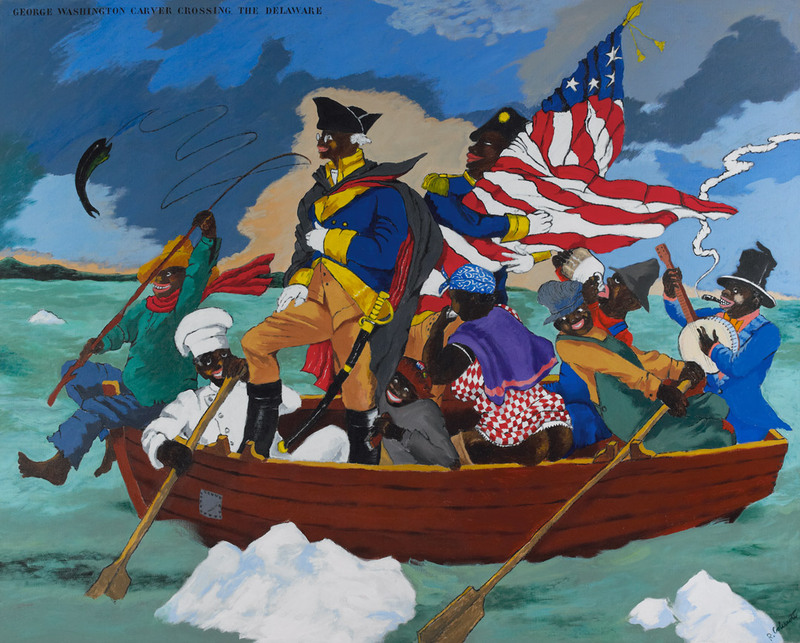 Images: George Washington Carver Crossing the Delaware: Page from an American History Textbook, 1975, Robert Colescott, acrylic on canvas, 84 x 108 in., Private collection, Saint Louis, © 2017 Estate of Robert Colescott / Artists Rights Society (ARS), New York, photo: Jean Paul Torno. 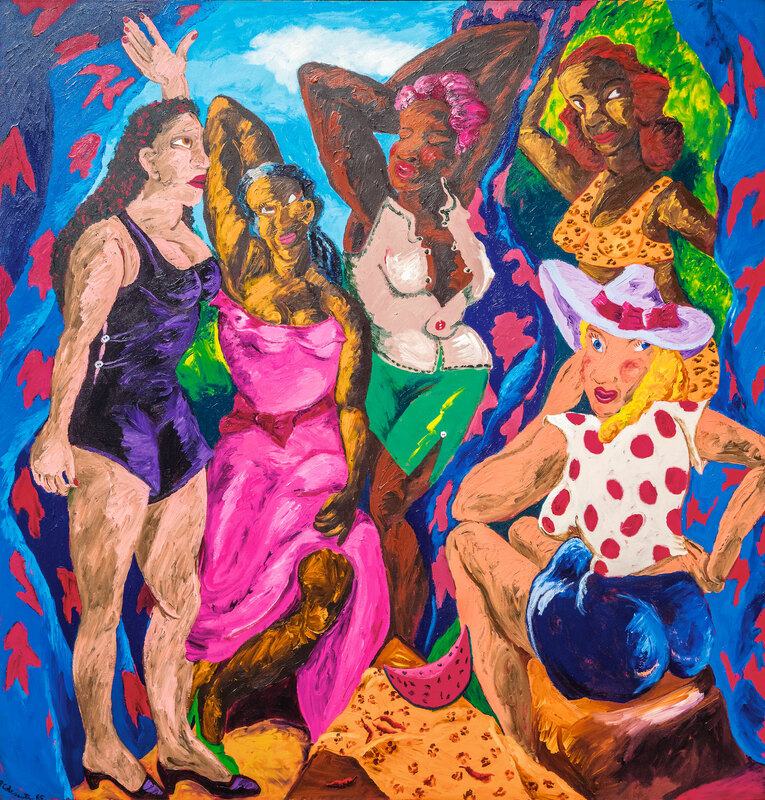 Les Demoiselles d’Alabama: Vestidas, 1985, Robert Colescott, acrylic on canvas, 96 x 92 in., Seattle Art Museum, General Acquisition Fund, Bill and Melinda Gates Foundation Art Acquisition Fund, Margaret E. Fuller Purchase Fund, and Patricia Denny Art Acquisition Fund, 2016.12, © 2017 Estate of Robert Colescott / Artists Rights Society (ARS), New York, photo: Mark Woods. 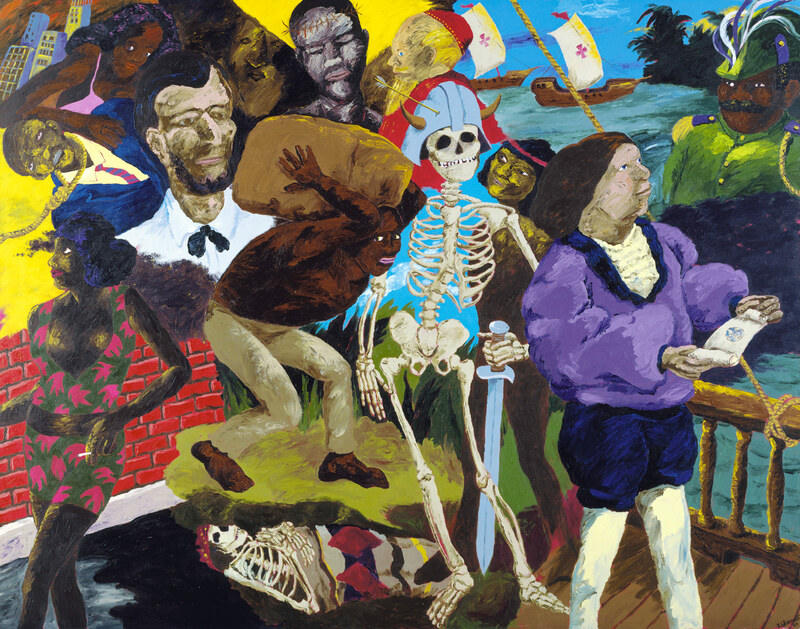 Knowledge of the Past is the Key to the Future: Some Afterthoughts on Discovery, 1986, Robert Colescott, acrylic on canvas, 90 x 114 in., The Metropolitan Museum of Art, New York, Arthur Hoppock Hearn Fund, 1987.166, © 2017 Estate of Robert Colescott / Artists Rights Society (ARS), New York / Art Resource, NY.